So much for riding on buses around parts of the UK I’m unfamiliar with. It’s great fun getting lost in places like Blackburn, but what about my own backyard of the West Midlands? I almost take for granted my local network because I know it well, but how about putting on my “strangers” hat and looking at it from a different perspective? Management-speak term it “Blue Sky Thinking”: just how good is my local network viewed from an irregular user’s perspective? My first bus in my home town of Wordsley is a 226 to Merry Hill. 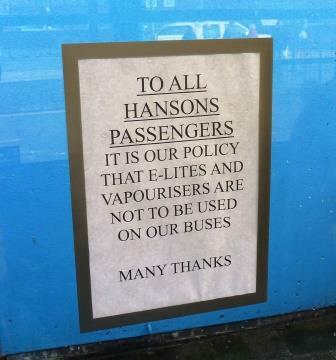 It’s a Hansons service – one of the few true independents in this part of the World. Its 2 minutes late but that doesn’t worry me and the old bloke waiting. This route also has Rotala’s Diamond operation on it, running on the opposite half hour, which is a lot better than a couple of years ago when it muscled in on the route 5 minutes in front of Hansons causing one of those “bus wars” that does nobody any good. My fellow traveller swipes his pass, I ask for an all operator “n-bus” ticket and hand my £4.30 over. Quick as a flash my ticket is issued by the friendly driver and we’re off aroun the houses on this circuitous route. The older generation pile off for some traditional shopping in the market town of Brierley Hill, whereas I stay on with the bright young (er) things down the road to Merry Hill – the out-of-town shopping mall that is attracting seemingly millions of Christmas shoppers. It’s mid-morning but the queues for car park spaces are already forming. The building of a new bus lane is also adding to the congestion, but will, of course, benefit us bus users in the longer-term. Merry Hill bus station is too small. Lots of bus services come here, but any attempt to make it bigger would mean losing the holy grail of car park spaces. And we can’t have that. Information is good though. 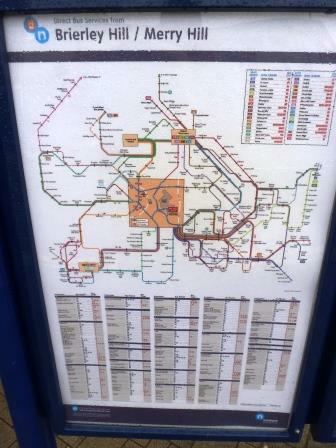 Provided by Centro, I peruse the board for buses to Halesowen – of which there are several. I hover around stands A & B with bag-laden shoppers and pushchairs the size of family saloons. Hansons are first to appear again with their 004 service, which is bound for Harborne via Halesowen. The route appears to have been a success for Hansons, who revived it after another small operator – Ludlows – first introduced it in the years following deregulation. Ludlows eventually sold out to Rotala / Diamond and the 004 disappeared, but now it’s back, and I jump on as the family car/pushchair moves into position, complete with crying infant, whose presence in the pushchair has been ousted by bags of shopping. Halesowen bus station was redeveloped and reopened in 2009. It’s modern and attractive, but has no toilets and the information desk is only open at certain times. I’m bound for the QE Hospital in Birmingham, and National Express West Midlands’ 99 route will take me there. This 20 minute frequency route has had some new Enviro 200 single deckers in recent times. Well-presented on the inside, the windows are filthy on the outside, such is the effect of December weather. Another healthy load ensues and our trusty stead tackles the mighty Mucklow Hill without any problems and we pass Quinton Cinema, overlooking the M5 motorway, which is showing “selected films” in 3D. Our driver is good, but he doesn’t wait for some passengers to be seated and there is a bit of wobbling as we traverse the streets of Quinton. Bus fans of a certain age will remember with fondness Quinton bus garage. Today, it is no more, replaced by a huge Tesco. A reminder, as Merry Hill is, that shopping is the new religion. The QE Hospital is huge. Totally redeveloped in recent years, it’s airport-like main entrance has all the trappings of, say, a Heathrow terminal, with shops, restaurants, coffee bars and even a huge fruit and veg stall to encourage you on your way to your 5-a-day. Info screen at QE Hospital – but where is “Hollywood Bowl”? 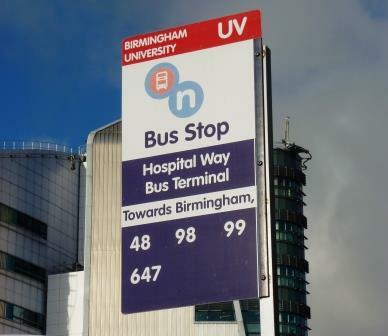 Rail provides fast, frequent services to the City Centre, but how easy is it to hop on a bus to Birmingham from here? 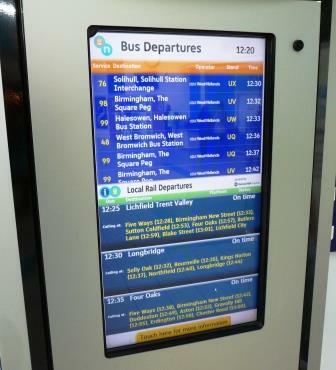 I watch the bus departures scroll around the screen. Are they “real-time” or just timetabled? The railway ones are definitely “as it happens”, but the buses? 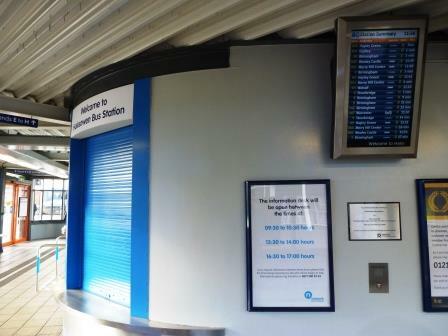 Across the way from the info screen is another screen (which is dead) next to which is a carousel full of paper bus timetables (although why they couldn’t position the carousel next to the info screen is another question…). I pick up what proves to be the last paper timetable for the 98/99 into the City Centre and see if what is in print matches what is on screen. Outside at the bus shelters, things aren’t too bad. 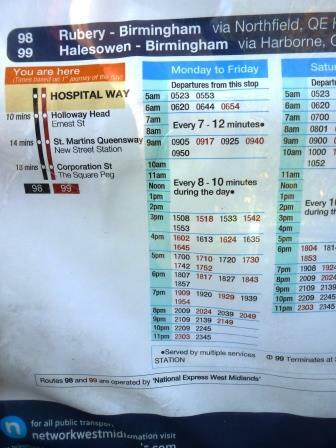 The bus stop flag clear shows “towards Birmingham” and the timetable shows “every 8-10 minutes”. 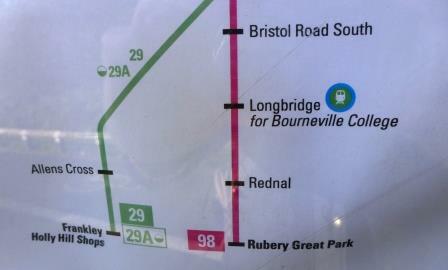 The map (produced by Centro) and the buses themselves on the 98 both show “Rubery Great Park”. Where is this “Hollywood Bowl” that sounds so enticing? 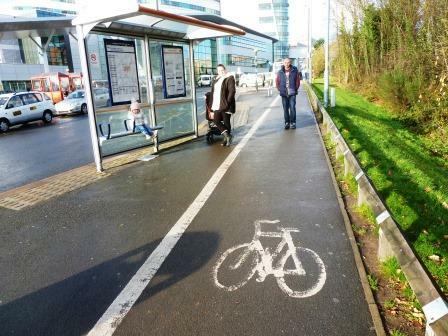 I also appear to be standing at a bus shelter but in the middle of an ill-thought-out cycle lane…. I’m on a 98 to Birmingham City Centre. National Express West Midlands’s Volvo single decker is again well-presented and I avoid the temptation to ask the driver if he’s just come from a Great Park or a Hollywood Bowl – there are quite a few boarding here. Next door to the QE is Birmingham University. Our bus passes the rail station that provides the competition. My mate in the pub reckons everyone’s a student these days – and judging by the hoards of studious young people I see here, he’s probably right! But only a handful board our service and we’re soon speeding off towards the City Centre. Nothing much happens save for a woman who almost manages to wrap herself around a grab-pole whilst trying to type a text on her phone and walk with several bags of shopping at the same time. Arriva have recently upgraded their 110 service to Tamworth to “Sapphire” status, meaning posh buses with leather seats, wifi and charging plugs for battery-hungry phones. These buses also go via Sutton Coldfield, so my n-bus ticket will be valid. NXWM also have new buses on the Sutton corridor, but Arriva’s offering trump them for comfort and style. There’s also audio and visual announcements on board, and on the Arriva website, you can spend fascinating hours watching these 110 service buses move around a Google map in real time. I decide to test the driver’s knowledge of what tickets are valid on his service and wave my n-bus at him, asking “can I use this to Sutton Coldfield please?”. I might as well have waved a beer mat from the Square Peg at him as he doesn’t seem bothered and waves me on board…. Erdington is as busy as ever. Kamikaze motorists run the island as if their lives depend on it and our driver certainly has his wits about him. There are plenty of takers at the row of shelters on Sutton New Road. Where Arriva win over in comfort, NXWM are tops for frequency. 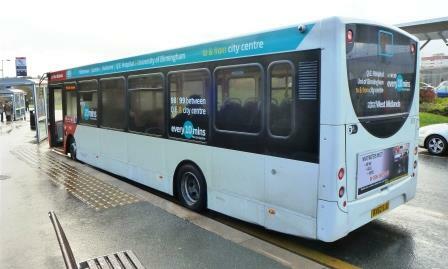 Our 110 is every 20 minutes to Tamworth, but the Sutton-Birmingham corridor has NXWM buses every 7 or so minutes. This is good bus territory. Sutton Coldfield is equally manic with a heady mix of shoppers and schoolkids. I hop off my posh bus and cross the road to jump on an elderly NXWM double decker on the 5 to West Bromwich. The Volvo deckers on this route are amongst the oldest left in the fleet, but they’ve been given some nice yellow branding. 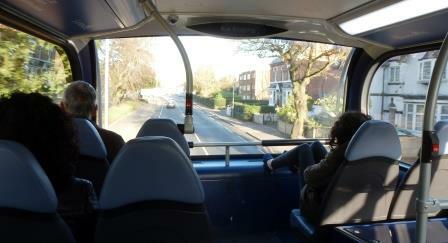 Inside, the seats seem very low, and it’s a long way down for this 6’7” passenger! It’s almost a full load on this 8 minute frequency service and inevitably we soon meet another 5 in front as the service begins to bunch. Litter rolls around the top deck. 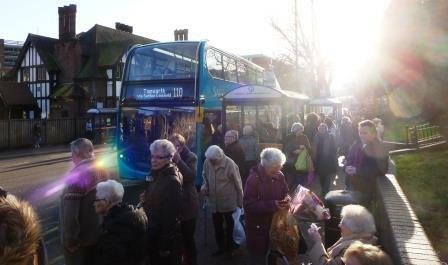 It’s mid-afternoon and our bus remains packed into West Bromwich town centre. I jump off at the bus station, unable to discern whether my bus is early, late or just keeping going! I genuinely have no idea where to go next and decide on a choccy bar to help ponder my next move. I go for the 289 all the way back to Merry Hill. A 5-year old Enviro 400 double decker from NXWM’s Pensnett garage is a solitary standout from a bus station full of West Bromwich garage vehicles. 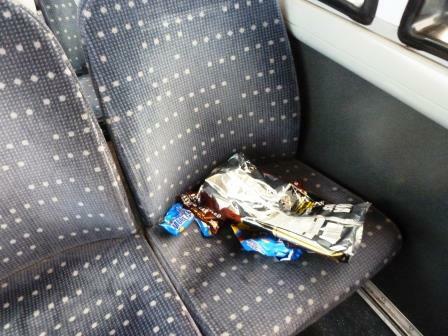 The bus is much newer than my last one, but litter is everywhere and the smell of stale cigarettes fills te upper deck. It’s quite unpleasant. The adverts are also depressing. Do I know the risks of not having a flu jab? Have I tried the pawnbroker shop? The best bus interiors feature marketing about how good the service is. This one seems to underline the downsides of life…. We pass through Oldbury, rechristened “Goldbury” in honour of a gold medal success of one of the town’s inhabitants. Bus stop flags are renamed appropriately. Let’s hope strangers to the town understand the tribute. We brake sharply to avoid a motorist who is trying to negotiate a traffic island whilst texting (no, they still haven’t learnt) and endure speed humps at speed on Lion Farm Estate as the driver clearly has no regard for the writer’s poorly back! School parking parents compete for the title of “most outrageous parking example of the year”. They’re really talented. We come to a standstill as gridlock ensues until one finally decides to move. 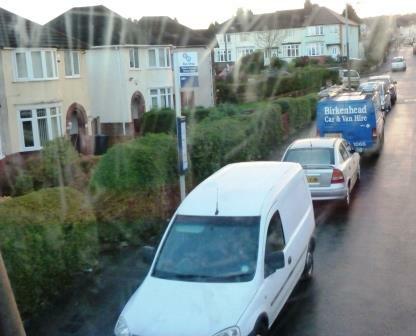 Further down the road, errant parking means access to a bus stop is out of bounds. It’s a good job a wheelchair user doesn’t want to use the stop. And a woman half way down the upper deck screams foul-mouthed abuse down the phone. I contemplate whether the recipient deserves it. Now we’re 10 minutes late, due entirely to pig-headed parkers and our driver is clearly having a bad day as he tries to emulate a Formula 1 driver along the rest of the route. 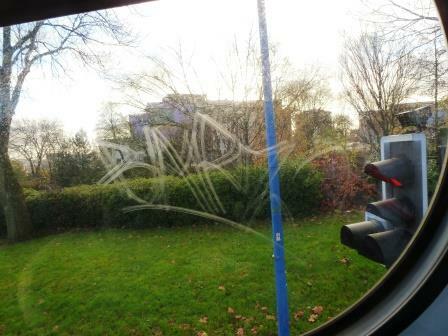 I gaze through yet another window containing etching – a curse that appears to affect the West Midlands more than many other parts of the country. We arrive back into Merry Hill bus station a good 13 minutes down. A gaggle of hi-vizzed bus drivers are gathered by the stand. “ee doe look ‘appy” quips one, pointing to our bedraggled driver, in his finest Black Country accent. And neither am I, having endured my cheap white-knuckle speed hump ride. I finish my jolly jaunt as I began, with a 226 from Merry Hill to Wordsley. It’s Hansons again. It’s now rapidly approaching the evening peak and the journey is nearly full. Another toddler has lost his seat in the buggy, replaced by a huge cardboard box with a picture of an even bigger buggy on it. Much crying and bawling ensues.